The Canterbury Tales is a pilgrimage, of course, but St. Jerome's University professor Norm Klassen concludes it is equally an homage to art that calls us to live beautiful lives, taking care to define beauty with reference to Christ. 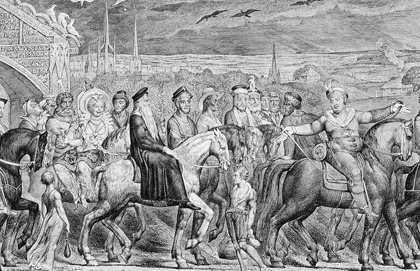 This article is a follow-up to "A Pilgrimage of Conversation" (Convivium, April-May 2015), which described the portrayal by Geoffrey Chaucer of the enduring togetherness of the pilgrim fellowship in The Canterbury Tales. Chaucer encourages his audience and readers to contemplate what it is that we owe one another if we can imagine a solidity or depth of being in one another that no amount of failure can eradicate (the imago Dei). As an artist committed to showing rather than telling, he can do so only by demonstrating precisely such failures. Enter the pilgrims, themselves tale-telling artists, with their shameless attempts to humiliate one another and, above all, to claim the last word. They stay together nonetheless, almost involuntarily bearing witness to resonating with "the interdependent life of a universe that is addressed and sustained by a Word from God," as Rowan Williams notes in Dostoevsky: Language, Faith, and Fiction. It is not, however, Chaucer's ideal that members of the pilgrim fellowship (which after all symbolizes the Church) should treat one another in such ways. He would have all pilgrims more intentionally participate as artists in this life sustained by the Word. The essence of living life as an artist is to allow the revelatory fullness of Christ to shine forth in the particularities of one's own existence. This vocation means responding to the call of the Gospel – the demand for obedience – in the specificity of one's own life situation. In this way, through interpretive, obedient responsiveness to God, the person (and, for Chaucer, more typically, the community) reconciles the unity of truth and the difference (or uniqueness) of historical being. Al be ther in hir tellyng difference. But doubtelees hir sentence is al oon." Even though there is in their telling difference. Chaucer adheres to the principle that the different Gospel writers bear witness to the same truth in their own unique way and imitates this reconciliation of unity and difference. One index of this commitment is the way he embodies this paradox in his own poetic style. Chaucer performs the dance of particularity interwoven with unity. First he draws attention to "every Evaungelist," alliteratively emphasizing their plurality, while in the next line he refers to their common message: "the peyne of Jhesu Crist." Alison Milbank has pointed out to me that, in rhyming "Crist" with another word (here "Evaungelist"), he does something Dante never allowed himself to do. Chaucer is pressing what it means to believe that everything finds its being in Christ by "rhyming" with him. In the next rhyming couplet, or pair of poetic lines, Chaucer repeats the pattern. First he recognizes plurality: "Ne seith nat alle thyng as his felawe dooth"; then he affirms that their "sentence" (that is, the gist of what they are saying) is all the same ("sooth"). The alliteration of ne, nat and natheless both reinforces difference (ne, nat) and restores unity (natheless). In a chiasmic X structure, Chaucer then flips the order, going from unity to difference in the following couplet: "And alle acorden as in hire sentence" repeats the emphasis on unity from the previous line, while the subsequent line affirms difference. This couplet also cheekily draws attention to the fact that two words that seem philosophically to represent opposite poles, sentence and difference, actually rhyme. In the next two couplets, Chaucer reverts to the pattern of preceding unity with difference. First we get a series of sliding sibilants: "For somme of hem seyn moore and somme seyn lesse." One can feel the line slipping away from one's control as the S's slide out of the mouth. Then Chaucer focuses pointedly on Christ's "pitous passioun," the plosive P sound grounding the line as the Incarnation grounds all reality. The phrase following, "I meene of Mark, Mathew, Luc, and John," reminds the audience of the manifold Gospel writers, their difference reinforced by the alliterative M's that, like the S's, resist containment. Then, like the P, the voiced declarative quality of B and D in the phrase "But douteless" pulls the poetry up short. Chaucer ends the sequence with the faith statement that the Evangelists' meaning is all "oon." The poetic combination of content and form displays a high level of both artistic and theological craftsmanship. Chaucer shows his readership, in Heavenly Participation, that in reality, one cannot sever the two categories of art and theology. Hans Boersma writes that "the one and the many [go] back to the heart of who God is" in explaining the importance of Trinitarianism. Chaucer agrees (despite the difference of his time and place). The reconciliation of unity and difference is important ontologically – that is to say, in terms of our understanding of being. This reconciliation is modelled performatively in God's self-revelation in Christ; historically, it issues in the Church's credal affirmation of the Trinitarian reality. The body of Christ participates in this divine reality in its ongoing responsiveness to God in the particularity of its historical situation. It can do so in no other way. The body of Christ participates in this divine reality in its ongoing responsiveness to God in the particularity of its historical situation. It can do so in no other way. One way to conceive of this demand is in terms of the feeling one sometimes gets of the need to respond to a sermon in a very specific way. A person may talk about feeling "convicted." The whole weight of the Gospel is concentrated for that person at that time in what it is that they feel they need to do. In Truth and Method, German philosopher Hans-Georg Gadamer draws on Protestant emphasis on the kerygma to elaborate a significant dimension of philosophical hermeneutics. Only in historical situations can the fullness of reality manifest itself. This is what beauty is: it has an irreducible quality of eventedness. Hans Urs von Balthasar has wisely counselled in Word and Revelation that we think of the lack of beauty in Christ (no form, no desirability) in the way that Paul instructs us to think of the foolishness or weakness of God (1 Cor. 1:25). The Christian's beauty is in a life of self-sacrificial obedience. Which else shows watr'ish, bleak, and thin. 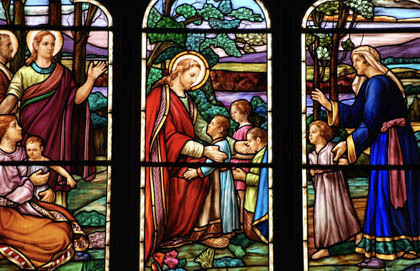 The Lord anneals his story in the "crazy glass" of our lives. "Doctrine and life, colours and light, in one / When they combine and mingle, bring / A strong regard and awe" – writing in the same Christian tradition as Chaucer, Herbert combines "sentence" (here, "doctrine") with "difference" (here "life"). The multiplicity of "colours" combines with unity of "light" to create a beautiful refraction. The "one" here is both a concept and a person, a parson, in whom the beauty of a virtuous Christian life brings "a strong regard and awe." In the extract from The Canterbury Tales discussed above, Chaucer musters the example of the Evangelists to support his claim that he will tell "a moral tale vertuous, / Al be it told somtyme in sondry wyse" (a moral, virtuous tale / even though it has been told in various ways at different times). The tale he then tells is his second chance, after his having told a story that the Host says "…at o word / …is nat worth a toord" (in a word / … is not worth a turd). Before telling that first tale, Chaucer had dropped a hint that he sees his role as similar to that of Dante. Like the great Italian artist, Chaucer sees the poet's task as showing the way that culminates in the beatific vision. Chaucer is perhaps more self-effacing than Dante (and funnier). He sees his limitations, just as he is well aware of the frailties of others. Yet he is as clear-sighted as Dante. His second tale urges the moral life in all pilgrims, a life of practical wisdom, which one Christian writer has described as "the knowledge of God's world and the knack of fitting oneself into it." All pilgrims are to live out their lives in the messiness of their particular circumstances; they are to do so in such a way that the story of Christ, annealed into it, can shine clearly through it. "At the irruption of the artist into a State department, officialdom stands aghast, not relishing the ruthless realism which goes directly to essentials. It is for the sacrilegious hand laid on the major premise that the artist is crucified by tyrannies and quietly smothered by bureaucracies. As for the common man, the artist is nearer to him than the man of any other calling, since his vocation is precisely to express the highest common factor of humanity – that image of the Creator which distinguishes the man from the beast." For Sayers, the artist goes "directly to the essentials" and lays a "sacrilegious" hand on the "major premise." The artist has the capacity to reveal dimensions of reality occluded by tyrannies and bureaucracies that attempt to reduce the real to patterns that supposedly indicate their mastery over it. (If we're honest, we'll all admit that we can be guilty of approaching day-to-day life in reductive and narrowly utilitarian ways.) The artist blurs such patterns and the conventional boundaries they establish. For Sayers, the artist is near "the common man." She or he gives hope to the common man that the major premise can be successfully challenged. The artist also represents the uncommonness of us all, made as we are in God's image. When we go out from ourselves to encounter God in our obedience to him, the fullness and the beauty of all things and of our destiny in God shines through for all to see, if only they, and we, can learn how to see. Norm Klassen is an associate professor of English at St. Jerome's University in Waterloo, On.